[Diocese of Puerto Rico] The Rt. Rev. 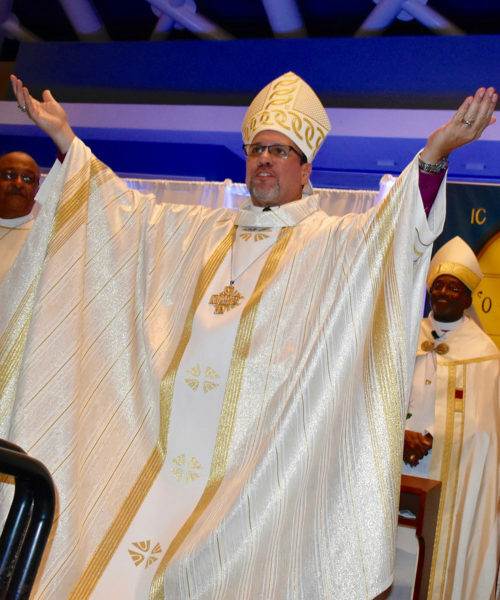 Rafael L. Morales Maldonado was ordained and consecrated the seventh bishop of the Diocese of Puerto Rico on July 22 during a Eucharist celebrated at the Pedro Rosselló Convention Center in San Juan. A native of Puerto Rico, Morales lives in Toa Alta and is the second Puerto Rican to be elected bishop of the diocese. Twelve hundred people attended the event, including ecumenical guests, government representatives and Episcopalians representing parishes throughout the island. Presiding Bishop Michael Curry preached and served as chief consecrator, co-consecrating bishops included, Bishop David A. Alvarez, retired bishop of Puerto Rico, Bishop Wilfrido Ramos Orench, who served as bishop provisional of Puerto Rico since 2014, Bishop Julio Holguin of the Diocese of the Dominican Republic, and Bishop Peter Eaton, of the Diocese of Southeast Florida. President of the House of Deputies the Rev. Gay Clark Jennings also attended. Parishioners from across the island sang in the choir, played music and served as liturgical dancers. Morales was formally seated at the Cathedral of San Juan the Baptist in Santurce on July 23.
desde Venezuela felicitamos al obispo Rafael Morales. dios le bendiga y le ilumine en su ministerio episcopal. es de desear que aquí en nuestro país nuestra iglesia logre los mismos objetivos de poder elegir un nuevo obispo, fruto del consenso y de la unión de todos los hermanos, dejando a un lado los intereses personales y las divisiones. Pedimos a Dios bendiciones para la diócesis de puerto rico y para la diócesis de Venezuela.